Founded by Alfred C. Kinsey in 1947, the Kinsey Institute has been a leading organization in developing an understanding of human sexuality. In this new book with over 65 images of Kinsey and the Institute’s collections, Judith A. Allen and the coauthors look at the work Kinsey started over 70 years ago and how the Institute has continued to make an impact on understanding on our culture. Covering the early years of the Institute through the “Sexual Revolution,” into the AIDs pandemic of the Reagan era, and on into the “internet hook-up” culture of today, the book illuminates the Institute’s work and its importance to society. Allen, J.A., Allinson, H.E., Clark-Huckstep, A., Hill, B. J., Sanders, S.A., Zhou, Liana. 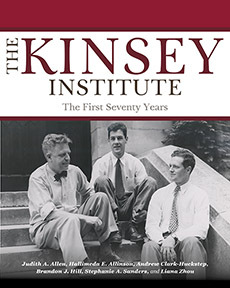 The Kinsey Institute: The First Seventy Years. Well House Books: Bloomington.